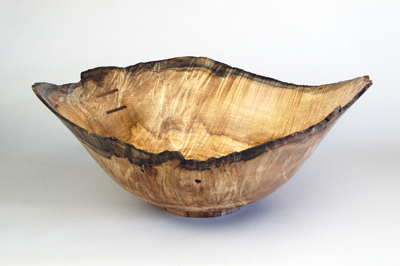 I first became aware of Jerry's work when we featured one of his natural edge turnings on our 'Featured Artist' page. That was a few years back, but I have kept in contact with both Jerry and Deborah during that time. Deborah, Jerry's wife, is kind enough to keep us updated with the latest news, the shows Jerry will be attending as well as details of the woodturning school. 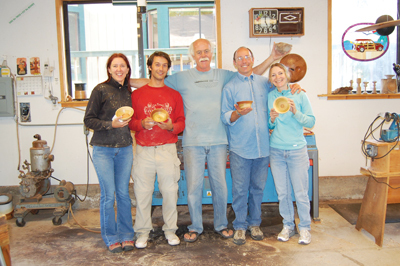 I started by asking Jerry, and Deborah, as she also features in this interview, about his background and how he found his way into woodturning. He tells me that he was born in San Gabriel, near Los Angeles in 1945: "My school year was spent there, but every summer we built a canvas-walled tent on the beach in Huntington Beach, California and I blissfully spent my days surfing the waves and building miniature boats. I went on to shape surfboards, larger boats, world-class sailboard centreboards and houses, always influenced by my love of the sea. This also meant I was/am sometimes surfing or windsurfing rather than working!" Jerry explains that Deborah is also an accomplished woodworker, business manager and artist consultant and they met when he moved to her hometown of Laguna Beach, California, while she was still in high school. The couple married in 1967 while Jerry was serving in the Navy. After he got out of the military in 1970 they shared the perfect first business, managing a surf shop on the Outer Banks of North Carolina: "With a strong background in theatre and an equal love of the sea, Deborah contributes creativity in her approach to life. I would not be where I am without her as my partner." Jerry started turning while specialising in Victorian restoration and boat work. He explains that in 1978, both he and Deborah moved their family and business from Santa Cruz, California to Hawaii: 'We further developed our woodworking/remodelling business, all the while raising our son, Walker, and getting into the water whenever possible. 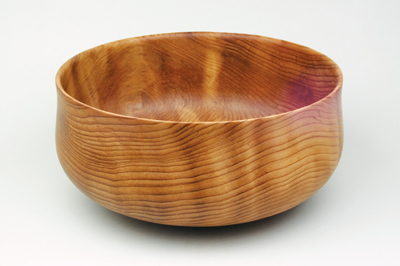 In 1984 a neighbour introduced me to the concept of turning bowls from freshly harvested trees. 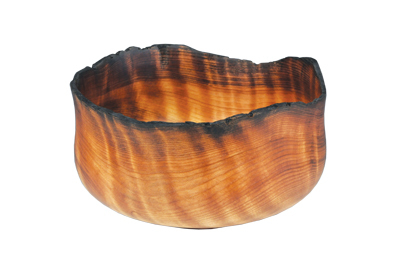 In Hawaii the bowl is a highly respected, cultural icon, and this form of woodworking soon became a part of our business. By 1991 we were caretaking a large country property and I was turning full time," he finishes. When I asked about turning style, Jerry comments that he would describe this as incorporating being free and fun, in that he gets to uncover nature's gifts everyday. In Jerry's words, "it is just like Christmas." He also tells me that he is very much inspired by the beauty of the grain and the stories it can tell: â€œI do not embellish my work in any way; it is always about the wood. The forms my pieces take are often open, happy forms flinging their arms out to the sky. I think 55 years of surfing the waves has given me a sense of fluidity in the form. My years making surfboards and windsurfers definitely feeds my creativity. Forms that work well in the ocean find themselves in my bowls, only kind of reduced in length,â€ he says. Other than becoming what he hopes to be a better turner after almost 40 years, Jerry feels he has not changed a great deal. 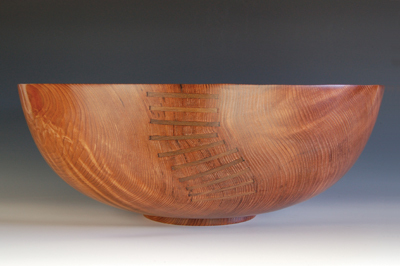 He tells me that Kevin Wallace once said, in reference to the way woodturning has been influenced by art done off the lathe, that he is the one to show us the way back to the wood. Jerry explains that this is his focus: "Finding the form that exhibits the grain patterns and character of the wood most beautifully. Oh, and trying to turn the 'perfect' foot." Jerry already mentioned the importance of the grain of the wood and his love of the sea, which are most definitely his most personal influences. He cites his biggest outside influence as being Jack Straka: "I never asked him but I wonder now if his influence was Bob Stocksdale. Turning wood in Hawaii was like turning in isolation. I was not very aware of what was happening on the mainland until the '90s. I came to the mainland and taught in some symposiums during that time but I think I was too in awe to really take in what was going on around me. We moved back to the mainland in 2000 and are now in the thick of doing major craft shows and teaching all over this big country and I am blown away with the talent and diversity. I think we are all influenced indirectly by each other," he comments. Jerry says that now his eyes have been opened, he can see that Bob Stocksdale, Rudy Osolnic and our very own Bert Marsh, have all been huge influences. Unfortunately, Jerry never got to know Bert or Bob but did get to spend some time with Rudy. All three had the gift of pure form, in his opinion. "I am honoured to be one who is working to carry it forward," he finishes. In terms of work space and the area in which Jerry turns his fantastic natural edge forms, he explains that the pair are now on their eleventh workshop, which has built up during the 40 years of woodworking. In the past the pair have used garages and early on in his career they rented what had been the brood house of an 1890 chicken ranch: "In Hawaii we built an entire college library from a single car carport, moved to a traditional industrial building with an upstairs office, but from that luxury to a screened in shed on a horse ranch with a 1940 school bus for an outbuilding. Our final Hawaii workshop, which we built along with our house on the North Shore of O'ahu, was open across the front and high in the back, forming an air scoop for the trade winds. When we moved to the mainland we rented a small section of an old, somewhat dilapidated dairy creamery that rained more on the inside than the outside." The good news is now they have the perfect workshop for woodturning; an 850 sq.ft out-building. Jerry installed a new electrical system, new lighting from an old school house, a fresh air system, four new windows, some cabinets and shelving, new drywall, paint and a new roof and, voila! A workshop: "The shop converts quickly to a school or gallery and I have a small wood stove for chilly mornings," he says. The workshop still has most of the tools Jerry needs for furniture and cabinetmaking plus five small Vicmarc lathes for the school, a Vicmarc 300, and a pedestal lathe that he designed back in 1986 that will swing 1,015mm. "Because I no longer have the Hawaiian trade winds, I designed a five-position fresh air system. The air is piped from the house fresh and clean and I can smell when the coffee is ready. I hope this is the last workshop we build." When I asked how long, typically, it takes to complete one of the natural edge pieces, the pair are surprised that I asked this question, which is apparently a crafter's most frustrating enquiry! The pair state that they prefer to answer this with a description of the process, as there are so many steps, and the only time one piece is worked on individually is on the lathe. "Even then, Jerry roughs out several pieces in a day, which go on the shelf to dry for up to a year," Deborah explains. "hen he finish turns a group before he turns the bottoms of all the bowls in that group. Before any of this can happen, he drives about 200 miles north to our primary redwood source, works with our logger choosing huge pieces of stumpage to be loaded into the trailer, spends the night, after dinner and wine with our good friends, and then heads home, where he has to get the wood out of the trailer using a come-along wrapped around a tree and driving the trailer out from under the log. Then the chainsaw comes out for him to cut turning blanks from the new wood. He either rough turns those as he cuts them, or waxes them for later turning. Once he has finished the feet on a group of bowls they are oiled. Then I burnish them with carnauba wax and steel wool." I was interested to discuss work ethos with the pair, as I instantly picked up on a strong affinity with wood that seems to be very deep rooted. 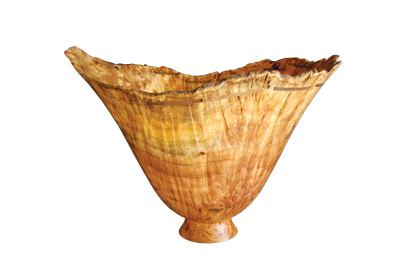 Jerry reiterates this and comments that he has made his living for the past 40 years working with wood full-time, but if he had tomorrow off you could still find him out in the studio playing with wood: "I love woodturning and it comes easy for me, but I am a maker. Wood is my medium. I find it very forgiving. I loved it when I did furniture, remodelling and church-work, during which time most of my turning was architectural. I found great pleasure in reproducing the gingerbread and turnings in Victorian remodels." Having said all this, Jerry states that he would like to paraphrase a quote from Confucius: "Choose a job you love, and you will never have to work a day in your life." Jerry also harks back to a line from a '60s song that said, "don't you work as hard as you play. "He tells me that he has just got back from a Friday road bike ride with some friends, and as well as turning, he also mountain bikes, surfs, windsurfs, sings, plays guitar and sings with a unique choir that writes its own music. "So, life is good! That's what counts!" During this part of the interview, Deborah states that she wishes to add something, as doing this profile is something of a joint venture. She reiterates that she and Jerry have been working together for 40 of the 45 years they've been married, so the highs have been shared and the lows have been weathered together: "And we weather lows quite well," she tells me. "We are both positive-minded people and the low points in our business we view more as challenges; we do well together when we are faced with a challenge, which is probably why we have been able to work together successfully all these years." She further states that neither herself or Jerry can really think of a 'low', but interestingly, there have certainly been rough spots - most recently when they moved from 22 years in Hawaii back to California, landing in the San Francisco Bay area in July of 2000, just as the dot com bubble burst and what was to be a difficult financial decade - and longer - was starting. "Our move was not primarily a business decision, but if it had been, it would have been a poor one. Re-establishing ourselves in our 50s, amid the financial disasters of the last 11 years has been difficult. But, we're still here, having lots of highs, which mean we can pay the bills," she states. A few of the highs she mentions includes watching their natural edge bowls presented as awards each year at the Hawaii International Film Festival in Honolulu. "When we were leaving Hawaii we held an open studio and invited every customer we'd had in our career there. It was amazing! They came and they cleaned us out of finished bowls, until Sharon Doughtie - then a fledgling turner - was climbing on the counter, pulling down drying, roughed-out pieces. People bought those, we shipped them to California with our goods, Jerry finished them when we got our studio up and running and we sent them back. What fun!" She further states that since the pair have been back on the mainland it's been exciting discovering new shows, travelling to new places around the country and making new friends. Their redwood pieces are being recognised as beautifully made symbols of California, and presented to international dignitaries, which is obviously a massive achievement. When I asked Jerry and Deborah about the direction in which they see their careers and work heading, Jerry again talks about his love of wood, being self-employed, and having had the pleasure of working with this fantastic medium for the last 40 years: "Woodturning is what I do for a living, but if I retired today, tomorrow I would probably get up and go out to my workshop and do some woodturning. It sounds so trite to say that I really love wood and I am still trying to find the perfect form, but guess what? I really do love wood and I am still on the search for the perfect form. I'm afraid that if I ever achieve it I will become a little puff of smoke and be gone forever,"he jokes. Jerry clarifies that on a serious note, teaching woodturning is a huge purpose in his life. 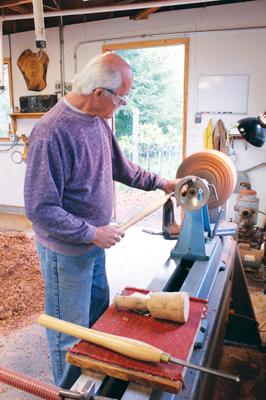 He feels that information and skills are like love and unless you share them they are worthless: "I have had my own school since 1986 and watching people get turned on to woodturning has brought me great pleasure. So, more wood, more students. Bring 'em on!" Jerry tells me that one of their future aspirations is to visit the UK and experience the turning scene here. Deborah also has strong ancestral links to both the UK and Scotland, and Jerry's grandfather came to America from the Isle of Man, so they would like to explore these further. It was a pleasure to carry out this profile, and even more of a pleasure to have both Jerry and Deborah involved in the process - a first for me! It is clear to see that the pair are a great team and they have created a business that is thriving and which is very much built on their strength as a long-standing couple. This is rare to see but also incredibly heartwarming. If you haven't already, then do visit their website. You can find out the latest news, sign up for regular email updates, and see more examples of Jerry's stunning pieces. 3. Pet the kitty: Always pay attention to the direction of the grain when you are turning a piece. Did you ever pet a cat the wrong way? OUCH!